February is off to a cold and snowy start in the Pacific Northwest. This spectacular image, seen by the NOAA-20 satellite on Feb. 6, 2019, reveals a wintry landscape in much of Washington state, Oregon and Canada's neighboring British Columbia province. 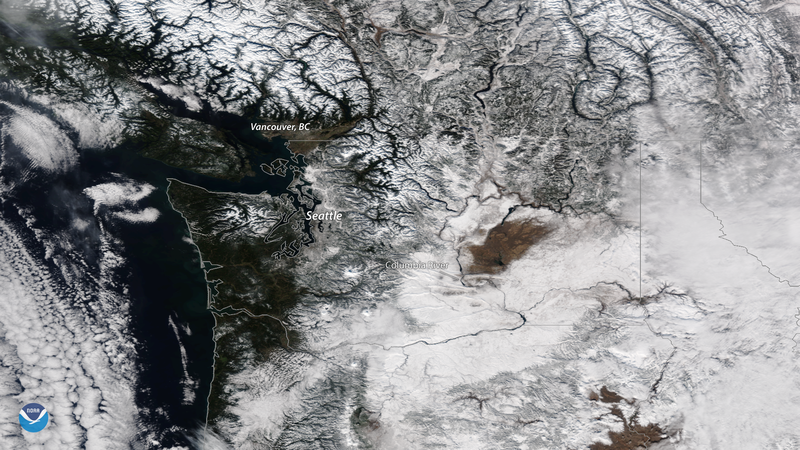 Clear skies allow us to see the meandering outline of the Columbia River Valley as well as the snowy peaks of the Coast Mountains stretching north of Vancouver. Nearly 3 inches of snow fell in Seattle earlier this week, and more is on the way. As the weekend begins, a winter storm will bring cold air and widespread accumulating snow to the Pacific Northwest. The National Weather Service is forecasting 6 to 8 inches of snow in the Seattle metro area, with up to a foot possible on the northern Olympic Peninsula across the Puget Sound. Winter storm warnings are currently in effect for much of the Seattle area, and heavy snow is expected to begin by mid-afternoon local time. Gusty winds out of the north will keep temperatures 10 to 25 degrees below average for the time of year. While winter storms frequently dump heavy snow across the Cascades and mountainous areas of the Pacific Northwest, major snowstorms are less common at lower elevations. Seattle averages only 6.8 inches of snow each winter – less than half of the average winter snowfall in Washington, D.C. or New York City. The city's last major snowstorm occurred two years ago, when 7.1 inches fell on Feb. 5-6, 2017. This true color image was captured by the NOAA-20 satellite's VIIRS instrument, which scans the entire Earth twice per day at a 750-meter resolution. The instrument provides high-resolution visible and infrared atmospheric imagery of clouds, fog, snow and ice cover, smoke plumes from wildfires, and more. An unlabeled version of this image is available for download here.